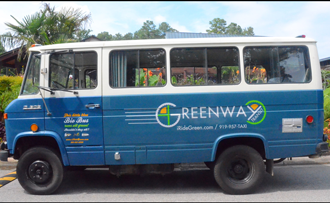 Greenway Transit, LLC, is a full-service transportation company located in Durham, North Carolina. We are the first and only green transport company in the Southeast, whose vehicles run exclusively on human energy or biofuels (biodiesel, veggie oil and ethanol-E85). With us, you can reduce air pollution and environmental impact and increase mileage and efficiency (Click the links for more info on biodiesel and ethanol). If it has to do with biodiesel, we can probably help you with it! We can and will help you improve the management of your oil over time. Managing your oil is important; the quality of the oil — both before and after a restaurant uses it — affects the biodiesel conversion process (and will have an effect on the value to us, and the value of your tax deduction).